This scene is a screenshot of a public school’s library. I was shocked when I saw it because if the principal did say it is a library, I would not recognize this as a library. It is important for the audience to understand the situation of public schools that public schools are crowded out. We literally can see and feel public schools are underfunded and experiencing the lack of resources. 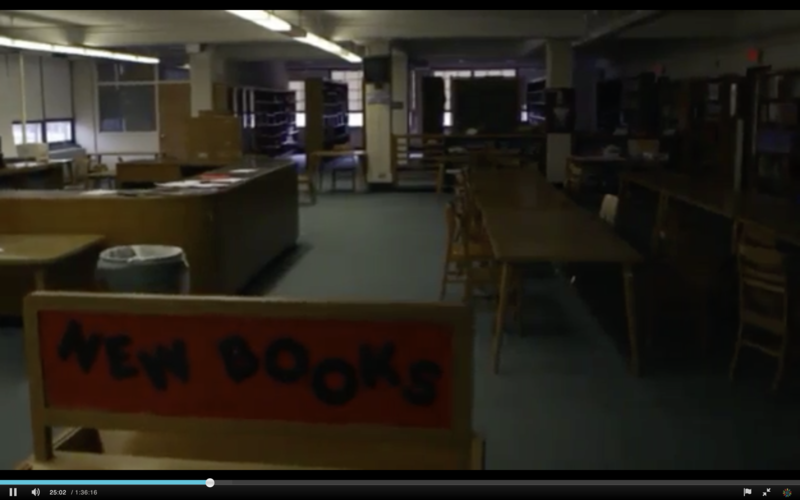 In this scene, the filmmaker portrayed a dim and small library. As we can see, nobody is in this library, even there is no librarian. Although lights are working, I believe if a student sits on the right part of this scene and read will not able to see words clearly. 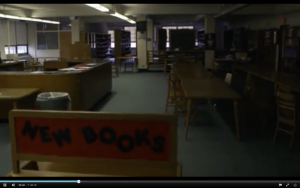 Especially, in the first half of this scene, a bookshelf with a sign, NEW BOOKS, is empty which means this library did not have new books, and the existing books may out-dated. I anticipate the filmmaker implies not a lot of students do not get benefited from this library because resources are severely inadequate. Ironically, the scene below describes students in a charter school are wearing decent uniforms, sitting in a bright room. They use tablets which reflects high-tech learning to acquire knowledge. Welner will agree with this video because there is real life example that supports his theory. Welner states, “Charters schools use their marketing and advising power to choose the student they want. If they don’t want to enroll English learners, their advising material will be all English”(Welner, p.2) In this video, a mother and her son explicitly said they had obstacles in applying because she did not speak English and had difficulty in understanding the applying procedure. The mother was disappointed since she was not able to give his son an opportunity to better education. By crowding out public schools, a bigger gap between education and inequality were generated. Students from low-income families had fewer options and the quality of education they received got worse. Previous Previous post: Backpack Full of What?